As the global leader in whole body vibration technology, Power Plate redefines optimal health and wellness equipment for every age and ability. Manufactured to the highest health and safety standards, each Power Plate is precisely engineered to apply the science behind the body’s natural response to destabilization. The Power Plate platform uses a consistent, safe and controlled level of vibration that moves in three directions (up and down, front and back, and side to side). Call 650-348-1259 For Best Pricing! Enhance your Power Plate massage and recovery experience with this soft support cushion. The Power Plate Power Shield is low profile, unobtrusive, and sits underneath your my3 or my5 machine to reduce residual vibrations. The Power Plate my7 Power Shield is low profile, unobtrusive, and sits underneath your my7 machine to reduce residual vibrations. The Power Plate Power Shield is low profile, unobtrusive, and sits underneath your pro5 machine to reduce residual vibrations. The Power Plate Cable Extension Kit is intended to "extend" your workout by adding length to our proMotion resistance cables and is designed to securely change the height and line of pull to suit any position or direction of resisted tension. 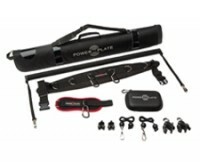 The Power Plate Total Body Cable Accessory Kit is intended to "extend" your workout by adding length to our proMotion resistance cables and is designed to securely change the height and line of pull to suit any position or direction of resisted tension. Health club and studio owners can control and manage Power Plate equipment usage with the proTRAC Write Device. The proTRAC Power Passes give authorized users access to Power Plate equipment controlled by the proTRAC System. © 2015 Balance Fitness. All Rights Reserved. Website by Waypost.